When Mr Brown stood up in front of the Labour conference in the midst of frantic speculation about how long he can remain leader and whether Labour can reverse their inexorably declining poll rating, what he said will likely go down in history as the speech that finally salvaged or sank his political career: it will either mark the beginning of the great New Labour revival, or it will herald a final, irreversible slip into obscurity for a prime minister who had once promised so much. It all started so well for Gordon. In the months after he took over he batted away crisis after crisis like flies on a hot day. Foot and mouth disease, terrorist attacks and floods were nothing he couldn’t cope with. Single-handedly, Gordon’s cool, calm and confident handling of these crises ensured that Labour shrugged off the personality-driven politics of Tony Blair. They looked so electable that Gordon decided to have an election. Everything was ready and the stage was set: after a period of revival, the opposition Conservative party was yet again in disarray; Gordon’s poll ratings were soaring; and Labour, once more, was a political powerhouse overseen by a competent and fearless leader. Then, for some reason, at the very last minute, Gordon decided not to go ahead with it. Just as many expected him to announce an election at which he was widely tipped to gain a generous popular mandate and trounce David Cameron’s Conservatives, it was made clear that there was going to be no election until the scheduled date in 2010. Gordon would have no popular mandate. In fact, he’d have no mandate at all – he wasn’t even elected as leader by his own party. After the election-that-never-was, as it became known, the economy started to crash, petrol prices went through the roof, there were countless scandals over personal data being lost and the building society Northern Rock almost went bust. 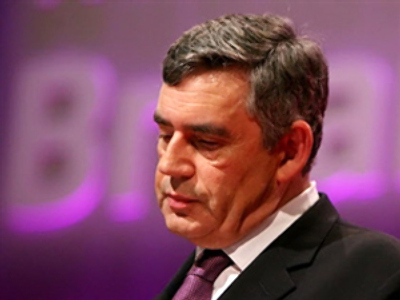 The Gordon Brown who had effortlessly resolved all those crises that had dogged the first months of his premiership was nowhere to be seen; this Gordon Brown was an incompetent, bumbling bureaucrat who, along with his equally incompetent cabinet who put their collective foot in it at every available opportunity, seemed hardly to be able to manage his way out of a paper bag. Even though Gordon wasn’t personally responsible for much of what went wrong, he got the blame anyway. By the beginning of 2008, popular opinion of Gordon was so low that he could realistically be blamed for more or less everything. Even the blame for England’s abject failure to qualify for the Euro 2008 championships in Austria and Switzerland somehow got laid at his door. Whatever he did, he just couldn’t get it right. So how did this happen? How could a competent and high intelligent man who had guided Britain’s economy so successfully for a decade suddenly lost the plot so completely? Largely, it came down to Gordon’s shy, demure, academic personality. 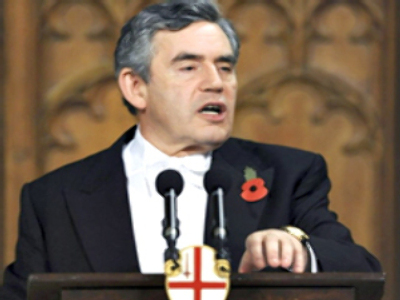 Whereas Tony Blair could waltz into a room, hold an audience enraptured by his inane grin and highly polished rhetoric, Gordon Brown tends to shamble. Whatever he wears, he somehow looks slightly dishevelled. And as for rhetoric, Gordon is a great deal happier expounding the parameters of one of his famous five-year economic strategies than he is winning over journalists and voters with a dazzling display of charm and wit. For all that Britain had gone off Tony, at least he had some charisma; Gordon, who is perhaps brighter, less dogmatic and more far-sighted than his predecessor, just doesn’t come across well in public, which, for a politician, is a fairly big problem. Gordon works best behind the scenes: he’s a deep thinker and an outstanding analyst. Blair critics say he was all style and no substance; Gordon, for all his spin-doctors, make-up artists and celebrity stylists, is very much the opposite. And so it has come to this. There are eighteen months until the next election (and it’s got to happen this time, regardless of whether Gordon wants it to or not), which might just be enough time for Labour to perform the greatest comeback since Jesus so long as they get things right. But is Gordon capable of getting things right? He told his party why he is. The speech was full of the usual Labour rallying cries: statements about fairness and equality went hand-in-hand with the announcement of quick-fix, short-term, poll-boosting policies like free prescriptions for cancer patients and free nursery places for two-year-olds. But this was still the same old Gordon: constant references were made to ‘a new global age’, without this peculiar and euphemistic phrase ever really being explained. Only when he was talking about the economy, which he did at some length, did he really seem comfortable. The speech also contained some touching personal moments: sensitive references to his wife and to his own scrape with blindness as a teenager were designed to soften the stony hearts of a conference hall which has spent the last three days muttering and rumour-mongering about who might replace him. These personal appeals came across as slushy and unnecessary, but they clearly had the desired effect on at least some of the delegates. All in all, it was classic Gordon: an intellectual, hard-hitting speech, heavy with euphemisms and double-meaning. Particularly poignant in this regard was his statement that this is ‘no time for a novice’ to do his job, which could have applied equally to David Cameron or to David Milliband, his own foreign secretary who has been eyeing the top job and who, pointedly, was one of the few members of the cabinet not to be personally praised in the speech. But it couldn’t really be said to have been charismatic or engaging. But then that’s Gordon all over. He represents a much-needed departure from the Blair years and perhaps his status as a politician rather than a celebrity will work in his favour. It is still too soon to tell if Gordon did enough to save himself and his party from electoral annihilation. He certainly made some appealing promises that will go down well with the party and the voters in the short term. But will he deliver in the long term? Will he prove himself capable of competently handing the next crisis that comes along rather than collapsing in a flurry of vacillation and indecision? Can he crush the internal opposition and, most specifically, silence the rather slimy but undeniably compelling figure of David Milliband? If he can, he might just pull it off.